Sabbati, 26 die Martii, 1681. Conference desired on passing Bills. Excluding Duke of Yorke from the Crown. Lords refuse to receive Fitzharris' Impeachment. SIR Robert Howard reports from the Committee appointed to consider of a more convenient Place in Oxford for this House to sit in, That the Theatre was the most convenient Place they could find for that Purpose. Resolved, That an humble Address be presented to his Majesty from this House, by such Members thereof as are of his Majesty's most honourable Privy Council, humbly representing to his Majesty the Inconvenience of the Place where the Commons now sit in Parliament: And that the House having, by a Report from a Committee appointed to consider of a more convenient Place for their Sitting, been informed, That the Theatre in Oxford is a more convenient Place for their Sitting; wherefore the Commons humbly beseech his Majesty to command the Theatre may be fitted and prepared for their Sitting there. 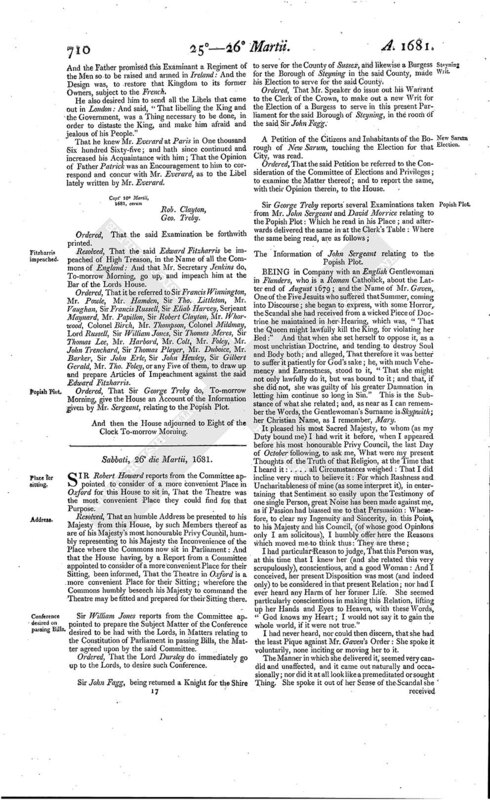 Sir William Jones reports from the Committee appointed to prepare the Subject Matter of the Conference desired to be had with the Lords, in Matters relating to the Constitution of Parliament in passing Bills, the Matter agreed upon by the said Committee. Ordered, That the Lord Dursley do immediately go up to the Lords, to desire such Conference. Sir John Fagg, being returned a Knight for the Shire to serve for the County of Sussex, and likewise a Burgess for the Borough of Steyning in the said County, made his Election to serve for the said County. 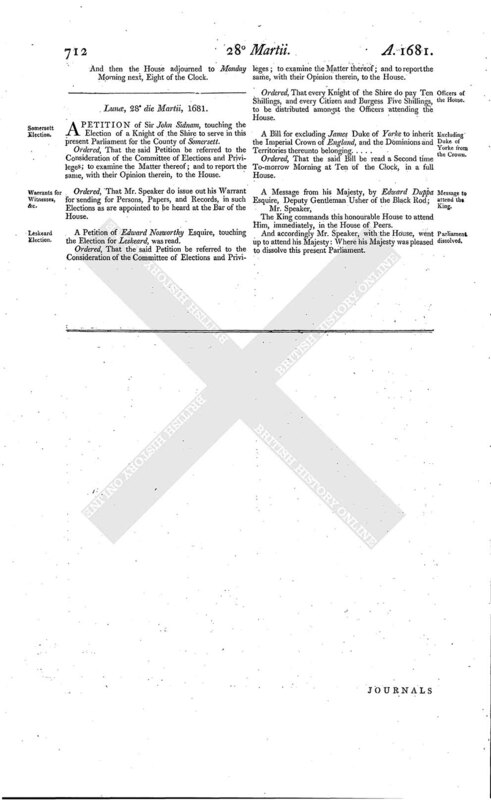 Ordered, That Mr. Speaker do issue out his Warrant to the Clerk of the Crown, to make out a new Writ for the Election of a Burgess to serve in this present Parliament for the said Borough of Steyning, in the room of the said Sir John Fagg. A Petition of the Citizens and Inhabitants of the Borough of New Sarum, touching the Election for that City, was read. 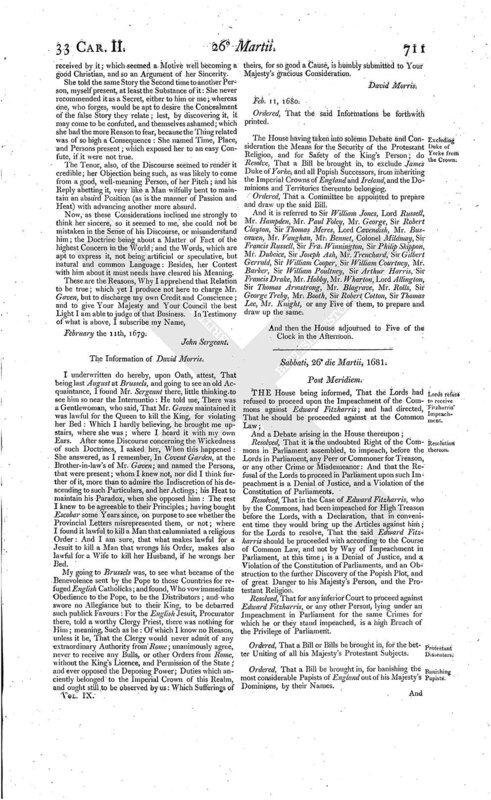 The Information of John Sergeant relating to the Popish Plot. BEING in Company with an English Gentlewoman in Flanders, who is a Roman Catholick, about the Latter end of August 1679; and the Name of Mr. Gaven, One of the Five Jesuits who suffered that Summer, coming into Discourse; she began to express, with some Horror, the Scandal she had received from a wicked Piece of Doctrine he maintained in her Hearing, which was, "That the Queen might lawfully kill the King, for violating her Bed:" And that when she set herself to oppose it, as a most unchristian Doctrine, and tending to destroy Soul and Body both; and alleged, That therefore it was better to suffer it patiently for God's sake; he, with much Vehemency and Earnestness, stood to it, "That she might not only lawfully do it, but was bound to it, and that, if she did not, she was guilty of his greater Damnation in letting him continue so long in Sin." This is the Substance of what she related; and, as near as I can remember the Words, the Gentlewoman's Surname is Skypwith; her Christian Name, as I remember, Mary. I had particular Reason to judge, That this Person was, at this time that I knew her (and she related this very scrupulously), conscientious, and a good Woman: And I conceived, her present Disposition was most (and indeed only) to be considered in that present Relation; nor had I ever heard any Harm of her former Life. She seemed particularly conscientious in making this Relation, lifting up her Hands and Eyes to Heaven, with these Words, "God knows my Heart; I would not say it to gain the whole world, if it were not true." I had never heard, nor could then discern, that she had the least Pique against Mr. Gaven's Order: She spoke it voluntarily, none inciting or moving her to it. The Manner in which she delivered it, seemed very candid and unaffected, and it came out naturally and occasionally; nor did it at all look like a premeditated or sought Thing. She spoke it out of her Sense of the Scandal she received by it; which seemed a Motive well becoming a good Christian, and so an Argument of her Sincerity. She told the same Story the Second time to another Person, myself present, at least the Substance of it: She never recommended it as a Secret, either to him or me; whereas one, who forges, would be apt to desire the Concealment of the false Story they relate; lest, by discovering it, it may come to be confuted, and themselves ashamed; which she had the more Reason to fear, because the Thing related was of so high a Consequence: She named Time, Place, and Persons present; which exposed her to an easy Confute, if it were not true. The Tenor, also, of the Discourse seemed to render it credible; her Objection being such, as was likely to come from a good, well-meaning Person, of her Pitch; and his Reply abetting it, very like a Man wilfully bent to maintain an absurd Position (as is the manner of Passion and Heat) with advancing another more absurd. Now, as these Considerations inclined me strongly to think her sincere, so it seemed to me, she could not be mistaken in the Sense of his Discourse, or misunderstand him; the Doctrine being about a Matter of Fact of the highest Concern in the World; and the Words, which are apt to express it, not being artificial or speculative, but natural and common Language: Besides, her Contest with him about it must needs have cleared his Meaning. The Information of David Morris. I underwritten do hereby, upon Oath, attest, That being last August at Brussels, and going to see an old Acquaintance, I found Mr. Sergeant there, little thinking to see him so near the Internuntio: He told me, There was a Gentlewoman, who said, That Mr. Gaven maintained it was lawful for the Queen to kill the King, for violating her Bed: Which I hardly believing, he brought me upstairs, where she was; where I heard it with my own Ears. After some Discourse concerning the Wickedness of such Doctrines, I asked her, When this happened: She answered, as I remember, In Covent Garden, at the Brother-in-law's of Mr. Gaven; and named the Persons, that were present; whom I knew not, nor did I think further of it, more than to admire the Indiscretion of his descending to such Particulars, and her Actings; his Heat to maintain his Paradox, when she opposed him: The rest I knew to be agreeable to their Principles; having bought Escobar some Years since, on purpose to see whether the Provincial Letters misrepresented them, or not; where I found it lawful to kill a Man that calumniated a religious Order: And I am sure, that what makes lawful for a Jesuit to kill a Man that wrongs his Order, makes also lawful for a Wife to kill her Husband, if he wrongs her Bed. My going to Brussels was, to see what became of the Benevolence sent by the Pope to those Countries for refuged English Catholicks; and found, Who vow immediate Obedience to the Pope, to be the Distributors; and who swore no Allegiance but to their King, to be debarred such publick Favours: For the English Jesuit, Procurator there, told a worthy Clergy Priest, there was nothing for Him; meaning, Such as he: Of which I know no Reason, unless it be, That the Clergy would never admit of any extraordinary Authority from Rome; unanimously agree, never to receive any Bulls, or other Orders from Rome, without the King's Licence, and Permission of the State; and ever opposed the Deposing Power; Duties which anciently belonged to the Imperial Crown of this Realm, and ought still to be observed by us: Which Sufferings of theirs, for so good a Cause, is humbly submitted to Your Majesty's gracious Consideration. Ordered, That the said Informations be forthwith printed. The House having taken into solemn Debate and Consideration the Means for the Security of the Protestant Religion, and for Safety of the King's Person; do Resolve, That a Bill be brought in, to exclude James Duke of Yorke, and all Popish Successors, from inheriting the Imperial Crowns of England and Ireland, and the Dominions and Territories thereunto belonging. Ordered, That a Committee be appointed to prepare and draw up the said Bill. And it is referred to Sir William Jones, Lord Russell, Mr. Hampden, Mr. Paul Foley, Mr. George, Sir Robert Clayton, Sir Thomas Meres, Lord Cavendish, Mr. Buscawen, Mr. Vaughan, Mr. Bennet, Colonel Mildmay, Sir Francis Russell, Sir Fra. Winnington, Sir Philip Skippon, Mr. Duboice, Sir Joseph Ash, Mr. Trenchard, Sir Gilbert Gerrald, Sir William Cooper, Sir William Courtney, Mr. Barker, Sir William Poultney, Sir Arthur Harris, Sir Francis Drake, Mr. Hobby, Mr. Wharton, Lord Allington, Sir Thomas Armstrong, Mr. Blagrave, Mr. Rolls, Sir George Treby, Mr. Booth, Sir Robert Cotton, Sir Thomas Lee, Mr. Knight, or any Five of them, to prepare and draw up the same. And then the House adjourned to Five of the Clock in the Afternoon. Resolved, That it is the undoubted Right of the Commons in Parliament assembled, to impeach, before the Lords in Parliament, any Peer or Commoner for Treason, or any other Crime or Misdemeanor: And that the Refusal of the Lords to proceed in Parliament upon such Impeachment is a Denial of Justice, and a Violation of the Constitution of Parliaments. Resolved, That in the Case of Edward Fitzharris, who by the Commons, had been impeached for High Treason before the Lords, with a Declaration, that in convenient time they would bring up the Articles against him; for the Lords to resolve, That the said Edward Fitzharris should be proceeded with according to the Course of Common Law, and not by Way of Impeachment in Parliament, at this time; is a Denial of Justice, and a Violation of the Constitution of Parliaments, and an Obstruction to the further Discovery of the Popish Plot, and of great Danger to his Majesty's Person, and the Protestant Religion. Resolved, That for any inferior Court to proceed against Edward Fitzharris, or any other Person, lying under an Impeachment in Parliament for the same Crimes for which he or they stand impeached, is a high Breach of the Privilege of Parliament. Ordered, That a Bill or Bills be brought in, for the better Uniting of all his Majesty's Protestant Subjects. Ordered, That a Bill be brought in, for banishing the most considerable Papists of England out of his Majesty's Dominions, by their Names. And then the House adjourned to Monday Morning next, Eight of the Clock.